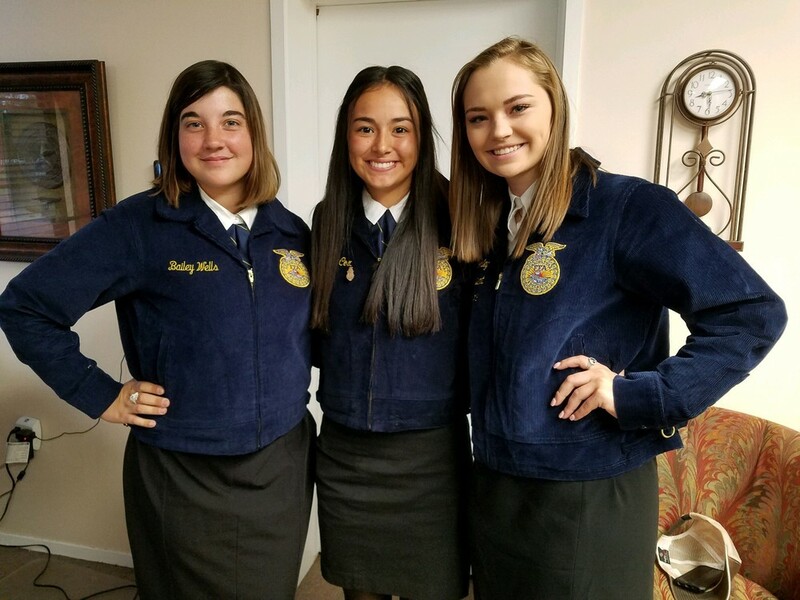 Following an impressive year for the Coahoma FFA Chapter, three members are heading to the 91st National Convention and Expo to represent the program in three very different roles. Julia Cox, Micah Worley, and Bailey Wells will all be flying out to Indianapolis this week to attend one of the largest student conventions in the world. More than 67,000 people are expected to participated in the four-day event. Cox will be competing against 47 other students from around the nation in the Greenhand Creed recitation contest. She qualified for the national competition by earning the Texas state championship in 2017 as a freshman. At nationals, Cox will be required to recite by memory the FFA Creed, which outlines the organization’s belief on the agriculture industry, and then answer questions directly related the creed by the judges. Her FFA Advisor Aaron Custer describes the sophomore Coahoma High School student as a strongly self-motivated person who is naturally competitive. “One of the best tools we are using right now is Julia is working a lot with the freshman this year that are going to be competing in the district Greenhand Creed contest on Nov. 8,” Custer said. Her reversal from competitor to coach has helped Cox to gain new insights into the meaning of the FFA Creed, Custer said. That honor also goes to Bailey Wells who was selected to the FFA National Band. Wells was chosen through a video audition process and will be joining musicians from around the nation to perform during the convention. She plays trumpet in the high school band and is a co-section leader. Wells was encouraged by her father, also a trumpet player, to try out. In high school, her father, Cody, was selected to the FFA National Band. The junior CHS student also said she wanted to lead by example to encourage her fellow peers to take chances. The road to nationals as one of 75 Texas delegates was a lengthy one for Worley. “Micah earned her spot last year when she won an area office,” Custer said. “It’s a long process. She interviewed with the nominating committee. She took a quiz showing her FFA knowledge, and she gave a speech in front of something like 450 to 500 kids. “It would kill someone to go through that who didn’t have the training they’ve had but by the time they are a junior in high school and the end of their junior year, it’s just natural,” Custer added. During the convention, Worley will serve on a committee and conference with the other Texas voting delegates. A fourth Coahoma FFA member will be featured at nationals. Emilee Custer will be the only FFA member from Texas who will be featured at We are FFA booth at the national convention. Emilee Custer’s photo and biography will be shown with students across the nation to show off FFA’s model members. This is the largest representation of Coahoma FFA members to attend the national convention under Aaron Custer’s advisorship. Since Aaron Custer joined Coahoma ISD, the FFA program has grow tremendously. Currently, 120 students are members of the Coahoma Chapter. Last year that membership was 100. Besides boasting a state champion in the 2017 LD events, the Coahoma Chapter had two teams place in the top 10 in the state their division - Radio Broadcasting and Ag Advocacy. Aaron Custer gives his students all the the credit for the chapter’s success. FFA - Future Farmers of America - is a national, student-run program designed to bring about personal growth, leadership skills, and community mindedness in young people through agricultural education. Custer said the program teaches a number of value-based lessons including responsibility, service and character along with providing an insight into the fundamental importance agriculture is to our society. “It’s about agriculture and agriculture education,” Custer said. “There is a huge place for it in these lives. It’s amazing to see a lot of these kids don’t know where their clothes come from, and they don’t know that we rely on agriculture all day, every day.